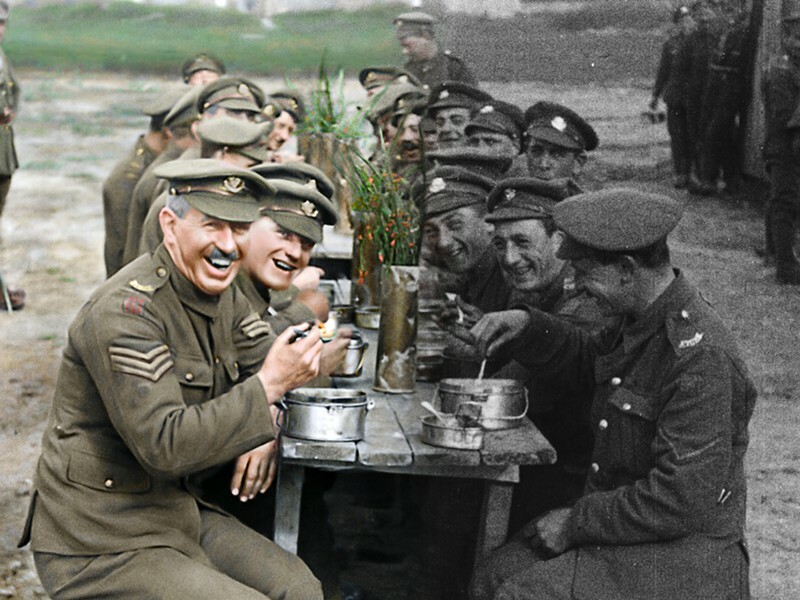 TRANSFORMED AND RESTORED Director Peter Jackson took formerly black and white, silent archival film footage, colorized it, and added sound for this documentary commemorating the 100-year anniversary of World War I's end. Glen Technically, this film is a remarkable achievement: The colorized and sound/dialogue-added segments are truly unique and interesting. The film is also laudable for its depth of research and the worthiness of its archival elements: In addition to the film footage, there are period posters, photographs, illustrations, and newspaper materials. And instead of a single narrator to explain things, the narration is made up of voice recordings of World War I veterans who talk candidly about the war, the battles, the deplorable conditions, and the death. The title seems to refer as much to the actual war dead as the young men captured in these films and pictures, remaining forever young on celluloid. That said, there's little new to learn here that World War I buffs can't see on the History Channel or its like. Maybe my expectations for some kind of new revelations were too high to be met. The documentary seemed more focused on the special effects than the story it tries to tell. The film has certainly garnered almost nothing but praise, but I found it a little slow and repetitive ... which is basically how I felt about Jackson's special-effects-laden series The Lord of the Rings and The Hobbit. Both trilogies bored me. Anna The technical aspects of bringing jittery, flat black and white images into true-to-life color is certainly an achievement, and Jackson proves himself up to the task. The gore and grit of war comes sharply into focus with the words of the men, who at the time were really just boys. Many of these men lied about their age to be able to join up, meaning boys in their young teens were going off to war before they had the chance to do anything else with their lives. As you said, the information is not new, and anyone with the expectation of discovery will probably leave disappointed. However, hearing the firsthand accounts paired with the colorized, almost fluid photographs is an interesting and honest way to present old facts. They Shall Not Grow Old was commissioned by a war museum to commemorate the centennial anniversary of the end of the war, and that's the kind of film it feels like to me—the glitz of Hollywood is nowhere near it and the unpleasant yet undeniable truth spelled out through the voices of the men that lived them. I'm not a big history or war buff, but I imagine that this film was made for those who are, and while I would have been perfectly fine watching this at home, the images are arresting on the big screen. Glen The messages that come clearly through from the voices captured many decades ago are universal: war is hell; we didn't know what we were fighting for; we were mistreated and reviled when we came home; and even those civilians who tried to commiserate couldn't because they didn't share our experiences. Despite those bleak messages, some of the men described having the time of their lives, feeling like they were a part of something important as a band of brothers. For me, the important and enduring message is that war is often pointless and fought by pawns that will gain nothing whether they win or lose. Some of the soldiers talked of captured German soldiers and how likeable they were. One said it felt like the British and Germans had more in common and should have been fighting against the French. War is usually stupid with few exceptions. The American Revolutionary War to gain independence from Britain, the War of 1812 to repel a British invasion, the Civil War to end slavery, World War II to defeat Hitler and Japanese imperialism—I can count on one hand the wars involving the U.S. that have made any sense to me, and we've been involved in dozens! One stat says we've been at war during 93 percent of our history! Today, we're involved in seven wars: the American intervention in Libya, the Yemeni Civil War, the American-led intervention in Syria, the American-led intervention in Iraq, the war in Somalia, the war in North-West Pakistan, and the now 18-years-long war in Afghanistan. What are we fighting about? What problems will these wars solve? What problems will they create? 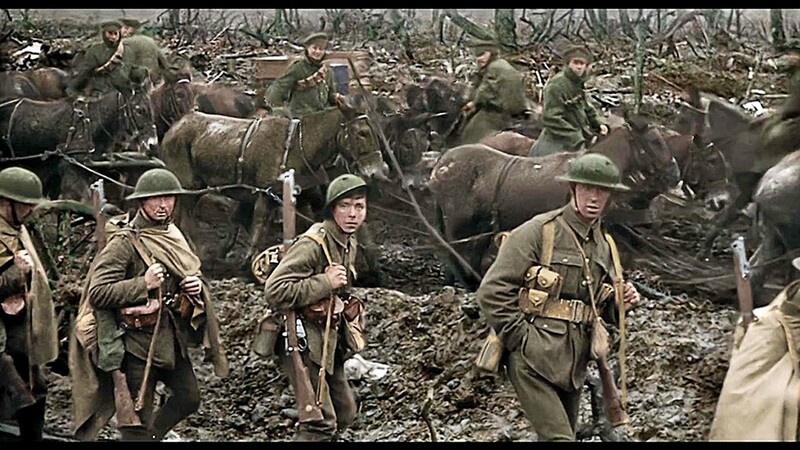 World War I—aka "The Great War" and "The War to End All Wars"—accomplished nothing except setting up World War II. Stupid. IN THE MUCK Narrated exclusively by archival voice recordings of World War I veterans, They Shall Not Grow OId offers a firsthand account of a war that killed or injured 40 million people. Split Screen is written by Senior Staff Writer Glen Starkey and his wife, Anna. Comment at gstarkey@newtimesslo.com.